Having some fun here learning to visualize data using Processing. 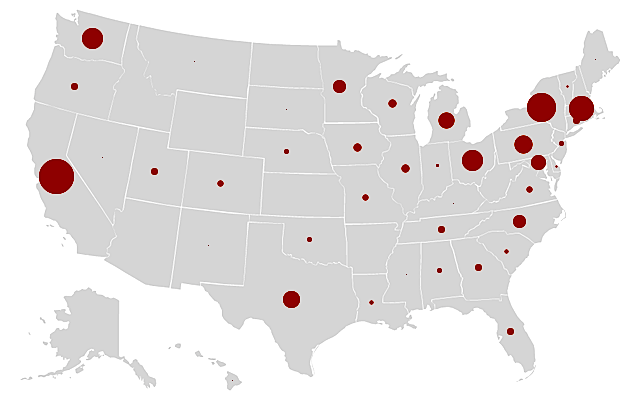 Here is a map showing the relative number of genetic testing laboratories. California is listed with the most (35 labs). *Note, these are genetic testing laboratories which may service a wide range of health care providers and clinics. Can you post the raw data – the testing centers you’ve counted? That would be a helpful resource. You have mapped the laboratories by state registered in GeneTests. A clinic is a location where a health care provider sees patients, literally “at bedside.” Many more than 35 clinics in California order genetic tests for their patients. Nice. Where’d you pull the data from?